Charles Kelly has been a defensive coordinator at two other schools and also filled in at the position at Georgia Tech in the middle of the 2012 season. Jimbo Fisher didn’t look far to find a new defensive coordinator. 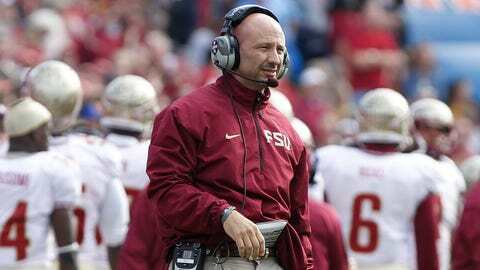 The Florida State coach has decided to promote linebackers coach Charles Kelly to defensive coordinator, according to reports by the recruiting site Noles247.com and SB Nation;s tomahawknation.com. Kelly would replace Jeremy Pruitt, who left Tallahassee on Jan. 14 to become Georgia’s defensive coordinator. Pruitt had won three straight national titles, two as Alabama’s defensive backs coach and then on Jan. 6 as Florida State’s defensive coordinator. The 46-year-old Kelly has been a defensive coordinator at Jacksonville State, Nicholls State and stepped in at Georgia Tech in the middle of the 2012 season when Al Groh was dismissed as defensive coordinator. Kelly coached the Florida State linebackers in 2013 but could take over as defensive backs coach (a title Pruitt also held), allowing Fisher and Kelly to hire a linebackers coach. Kelly and defensive ends coach Sal Sunseri were hired in January 2013 by Fisher, and both were considered strong prospects to take over as defensive coordinator if Pruitt left. Sunseri will also receive a promotion to assistant head coach, Noles247 reported. Kelly earned a base salary of $275,000 in 2013, not counting bonuses. But he will likely more than double his salary and into the neighborhood of Pruitt’s base salary ($500,000) from 2013.